Bath time is an important time for you and your new baby, both for keeping them clean and for having a bonding moment between the two of you, with cuddles and songs! 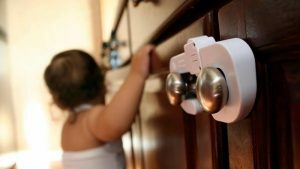 However, placing your baby right into a grown-up bathtub can be a little nerve-wracking, as your little ones could easily slip and hurt themselves. You can avoid this worry with a baby bath bucket! But how do you choose the best baby bath bucket for you and your newborn? 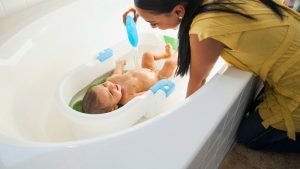 Read on to learn everything you need to know about baby baths, as well as some of the best options on the market today. What Is A Baby Bath Bucket or Bathtubs? Baby bath buckets, also known as baby bathtubs, are a smaller kind of tub that allows you to wash your baby without placing them into a larger adult bath tub. 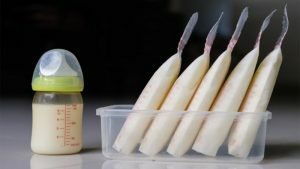 They can range from a standard plastic tub to a hammock shape that supports your newborn’s back, to inflatable or fold-up versions that are easily packed away when not being used. Often, baby baths are made from foam or polyester materials that cradle your baby and prevent them from slipping around during the bath. Some baby bath buckets sit in the sink or an adult bathtub, while others stand alone. Baby bath buckets that fit in the sink may be the best option for you if you have a small living space without a bathtub. The most convenient baby bathtubs are ones that provide more than one possible support position for your baby, who might prefer to take their baths sitting up as they get bigger! Of course, you may decide that you don’t need an extra designated bathtub for your baby. Plenty of parents simply sit in their own adult bathtub with their newborn on their lap and wash them that way. However, taking a bath with your baby is not always the most convenient option, especially since babies are known to suddenly poop at the most inopportune moments! Giving your newborn baby a bath for the first time can be an intimidating thing. Babies are small and vulnerable, and the last thing you want is to hurt them! Here are some tips for keeping your baby safe during a bath. First and foremost, always remember that when there is water present, you must supervise your baby at all times. An infant can drown in just an inch or two of water, and unlike in the movies, drowning can be a silent event. Always keep within reach and sight of your children at bath time! This means placing everything that you will need during a bath within reach of the tub, so you do not have to walk away to get it. These things include soap, towels, shampoo, and a fresh diaper and change of clothing for your baby. Never leave your baby alone in the bathroom! You also want to be sure that the bathwater is an appropriate temperature before placing your baby in the water. Your baby’s skin is a lot more sensitive than yours, so keep the water lukewarm! Test the water on your wrist, forearm, or elbow to make sure it is not too hot. It is also a good idea to have plenty of towels or bathmats on hand to sop up spills. Whenever you have a baby splashing in the water, you are inevitably going to end up with water on the floor around the tub or sink! Clean up those spills right away so that you will not slip or fall, hurting yourself and potentially your baby as well. Safety experts strongly discourage using bath rings or bath seats, which orient your babysitting upright inside the adult bathtub. 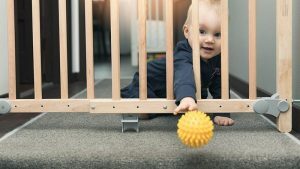 If your baby slips through the ring, they can become trapped underneath the water, and the result is even more hazardous than if they had simply been set into the full bathtub without any assistance. There are a lot of types of baby bath buckets to choose from. Here are some of the best ones out there! 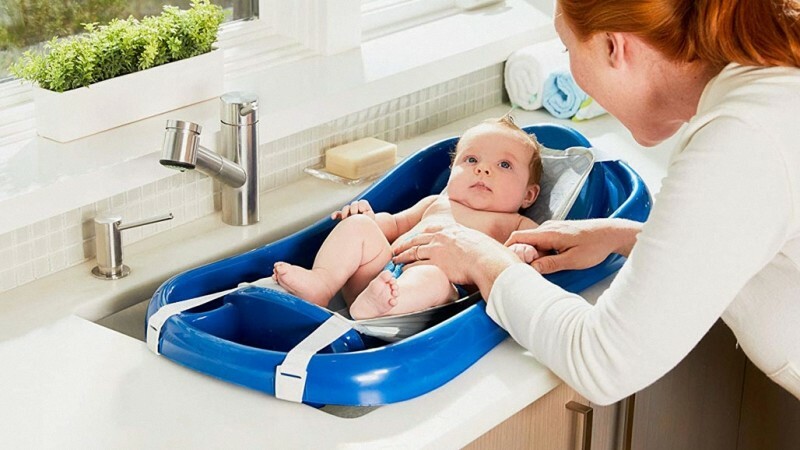 This baby bath tub fits in the sink and has a mesh attachment which suspends the baby over the water just like a hammock. You are looking for a simple, safe, durable baby bath which you will be able to use throughout your child’s early life. This rigid plastic tub has an adorable lotus flower shape with a soft fabric interior, and is designed to be fit in the sink. You plan to always wash your baby in the kitchen sink. This plastic tub is much larger than most baby bath buckets, and is sturdy enough to last while your baby grows. You don’t plan on washing in the sink, and want a simple bath tub which will allow room for your baby to grow! Now you’re ready to keep your baby clean and safe!